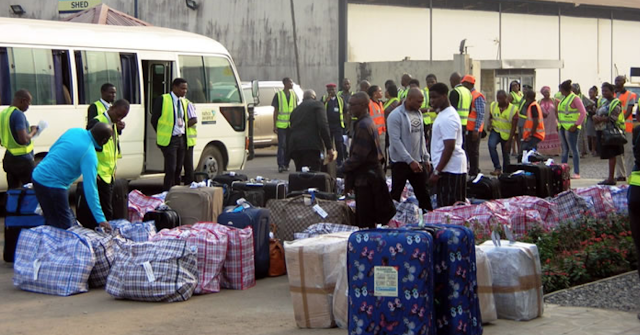 Twenty-nine Nigerians were on Thursday deported from six European countries over issues related to immigration offenses. They were deported from Austria, Switzerland, Belgium, Germany, Norway, and Lithuania. The News Agency of Nigeria reports that the deportees arrived at the Murtala Muhammed International Airport (MMlA) Lagos about 7.35am. The deportees, all men were brought in a chartered Titan Airways aircraft with Registration Number: G-POWD. DSP Joseph Alabi, the spokesman, Lagos Airport Police Command, confirmed the development to NAN. He said the deportees were received by officers of the Nigerian Immigration Service, the National Agency for the Prohibition of Trafficking in Persons and the Nigeria Police. Also on ground to receive them were officials the Federal Airports Authority of Nigeria and the National Drug Law Enforcement Agency.